To drink, I had the pink lemonade mixed with vodka and my friend had a tall can of distinctively Mexican Tecate beer. We ordered the corn fritters to share – they were crispy, greasy and full of butter, deep fried to the core. Inside each piece were individual corn kernels and some herbs which gave texture and some color. 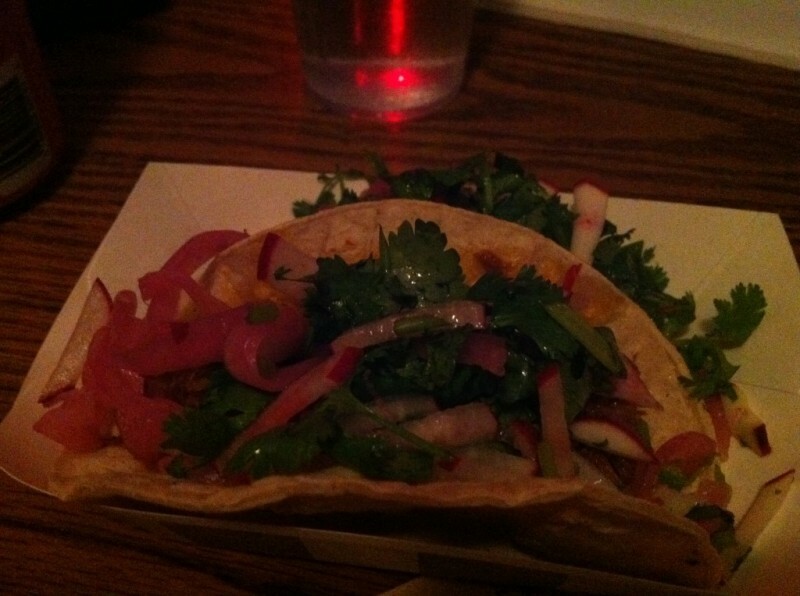 Next, I had the vegetarian taco with refried beans, feta, coriander, radish, cilantro, tomato and a wedge of lime which I squeezed all over the two tacos that came in a paper box. It was ah-mazing. My two other friends both got the pulled pork tacos which were basically the same in terms of toppings minus the feta and instead of refried beans, there was pulled pork. Having voracious appetites, we devoured everything in literally seconds. Tags: Bernard, Corn, Deep Fry, Diner, Dinner, DJ, Fritters, Gourmet, Grumann's, Lemonade, Midnight, Montreal, Nouveau Palais, Snacks, Tacos, Tecate.